We inhabit cities, we use them daily, we roam through its streets, how often in motor vehicles; we walk through them, more or less hurriedly. When we impose appropriate rhythm and mind, we become passers-by a little more conscious, we see. We see the orientation of streets, we see elements that here and there are settled in the axis of the eye, we encounter familiar buildings, sometimes we discover new objects that awaken our senses. Portuguese cities have stone carpets. But how many times do we realize them? The aim of this work is to contribute to the appreciation of the Portuguese sidewalk, closely observing Faro’s pavements, its squares, sidewalks and pedestrian areas. We cross them, identifying motifs, friezes, and patterns to discover identities, affinities, and singularities. We highlight the elements that deserve to be known and explored by those – inhabitants and visitors – who seek rich experiences of meaning, discovery and surprise. 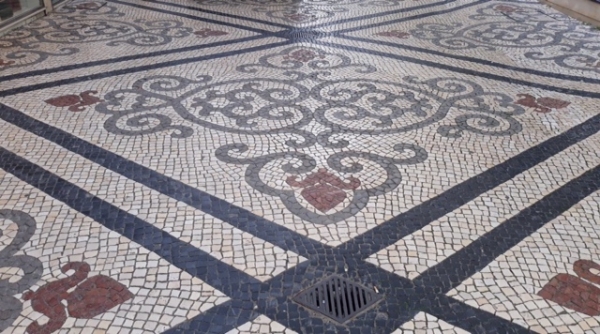 The cultural and artistic value of Portuguese sidewalk is an excellent opportunity for aesthetic appreciation and geometric research. This audio-visual document is an invitation to the exploration of Faro’s sidewalks, through one of the oldest and most basic mathematical concept, which is symmetry. This work is financed by national funds through FCT - Foundation for Science and Technology, I.P., within the framework of the project reference nº UID / GES / 04470/2016 "